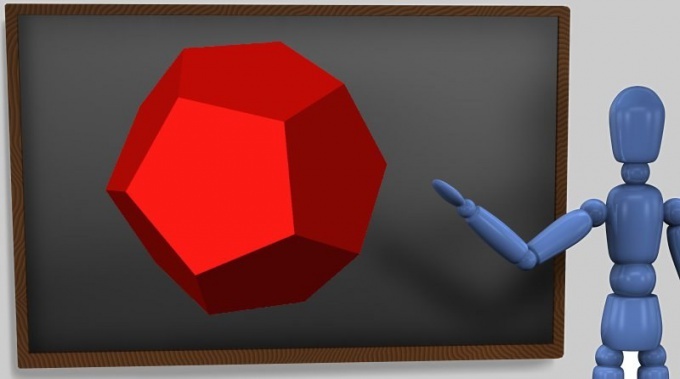 The dodecahedron is called volumetric figure composed of twelve pentagons. To get this figure, you must first draw it scan on thick paper, and then collect it from the scanner in space. Start with a Central drawing of a regular Pentagon. To do this, draw the compass circle. Swipe through its center diameter. Now it must be divided into three parts. There is a theorem to prove that the trisection (i.e., division of a segment or angle into three equal parts) with a ruler without graduations and compass is impossible. So either measure the diameter with a ruler and divide it into three, and then tick the corresponding point on the ruler, or measure it with a piece of thin wire, fold it three times, then flatten, put on the diameter and mark the points in the crease. The result of dividing the diameter into three parts it will get two points. Through one of them, swipe to the diameter by means of a square perpendicular. He crosses the circle in two places. From each of them swipe the beam passing through the second point on the diameter. They cross the circle in two places, and fifth place crossing forms the diameter. Will only have to connect them together, and you get a regular Pentagon inscribed in a circle. Draw in the same way eleven pentagons and arrange them so as to obtain a figure like the one shown in the figure. Pririsuyte to its small side faces of the petals to facilitate gluing. Then cut it and glue. What should be the result, shown in the illustration in the header of the article. Since the dodecahedron twelve faces in the shape of this figure it is possible to produce three-dimensional, stable desktop calendars. To do this, first make on each of the faces on the calendar for one month, and then cut out and glue figure. Also, this calendar can be generated automatically by clicking the link below. Year is automatically detected by the integrated clock of the server, and the language of the names of the months and days of the week - the settings of your browser.